New Signup Forms Available from Benchmark Email! As a small business owner you may have a lot on your plate. That’s why at Benchmark Email it is always our goal to make things as simple as possible for you. We’re here to uncomplicate your lives and aid your businesses. We’ve discussed the fact that email marketing is one solution to that problem until we’re blue in the face. Now we’re making that even easier too. This week we rolled out over a dozen new signup form templates. 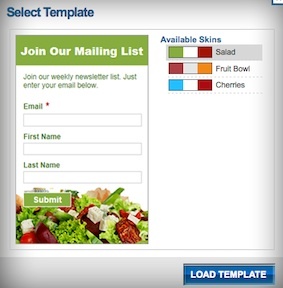 Just like our email templates, you can customize them to your liking as well. Say you love the Stripes template, but the brown would clash with your site. No problem! There’s three other color options and you can even tweak the colors yourself. What’s important is that you can find the perfect signup form for your website to help your email list grow. To access the new signup form templates, you don’t have to do anything different in the signup form creation process. Click on the Create Signup Form box on your account homepage. Name the signup box and choose which list you want to connect it to or create a new list. Hit Save & Next. At the top of the page you will see all of the signup form templates. Find one that suits your company, brand and webpage. If you’d like to change the colors, you can click “change color scheme” under the preview pane. On this page you will also pick which fields you want in your signup form and upload your company logo. Continue through the creation process and enjoy your spiffy new signup forms!